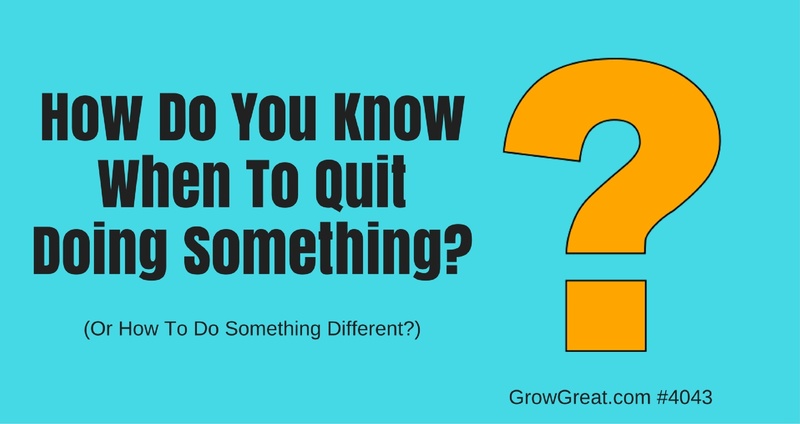 Q&A #4043 – How Do You Know When To Quit Doing Something, Or How To Do Something Different? Today’s show is a quick 9 minute answer to a question I get fairly often. It’s quite a few questions rolled up into one. How do I know when to quit something? How do I know when I should do something different? How do I know if what I’m doing is working? And there are others, but you get the drift. It’s not complicated, but it can often be very difficult. That’s why increasingly I urge people to surround themselves with better people who can serve them. Your crowd – the people you choose to surround yourself with – can become your best decision-making tool. I so firmly believe it in I’m producing a podcast for Leo Bottary at LeoBottary.com – Year of the Peer podcast. Leo is fond of saying, “Who you surround yourself with matters.” Check out the podcast. It’s an interview-style podcast with some exceptional guests including Rich Karlgaard, the publisher of Forbes. Now, go figure out what you can do better to grow a great business (and a great career).